The Internet of Things takes the intangible online world and gives it physical form by connecting electronics, sensors, and applications over the net. What makes this trend so transformative is the potential to harness information in new ways -- some of which we're already seeing, and others yet to be invented -- in the interest of improving quality of care. Electronic Health Record (EHR) systems are already in widespread use in hospitals, and as these systems take root they’re showing a number of benefits. For pharmacists, the ability to keep patient information up to date in real time means improved drug interaction monitoring, quicker and more accurate dispensing, and a curtailed potential for abuse. But it’s not just pharmacy workflow that becomes more efficient; because the IoT can assist with everything from quicker prescriptions to quicker reimbursement, it frees up pharmacists’ time in other areas as well. This development is advancing on multiple fronts. On one hand, the aforementioned use of RFID tagging doesn’t only improve efficiency, but also stands to drastically cut prescription errors. However, a new Pill Image Recognition Challenge implemented by the NIH seeks to create imaging software that improves visual identification of pills, which stands not only to help pharmacists, but can likely also be incorporated into automated workflows as well. Abbot's Freestyle Libre, a blood glucose meter that's smartphone-connected, is perhaps the most visible example of using IoT devices for improved adherence to a treatment regime. Literally removing a pain point is vital for improving outcomes, after all. However, one could easily imagine expanded uses of this technology, including smart pill bottles that track and report patients' medication adherence, and/or alert pharmacists when a refill is needed. One of the biggest promises, and implicit challenges, facing healthcare in recent years is the potential of big data and how best to leverage it to improve patient outcomes, workflow, and efficiency. When properly used — especially in conjunction with automation technology and smart pharmacy workflow design — we believe that IoT tech will increase pharmacists’ opportunities to interact with their patients, improving retention and patient outcomes in the process. Taking full advantage of new technology requires flexibility and agility. On one hand, this requires a mental shift; we need to open our minds, and take the time to understand new applications in order to better explain them to those we serve. On the other hand, it requires a degree of flexibility in how we use our limited space to make the best use of likewise limited time. 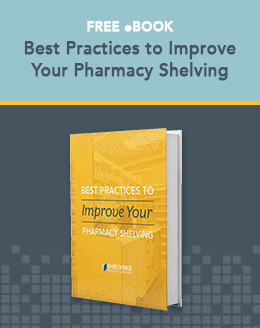 Keeping our pharmacy designs flexible helps us incorporate new technology, but also to better allocate space — whether it’s a new display area, or a part of the sales floor that’s explicitly set aside for patient education — as new needs and possibilities arise. For help taking full advantage, get in touch with Shelving Design Systems.